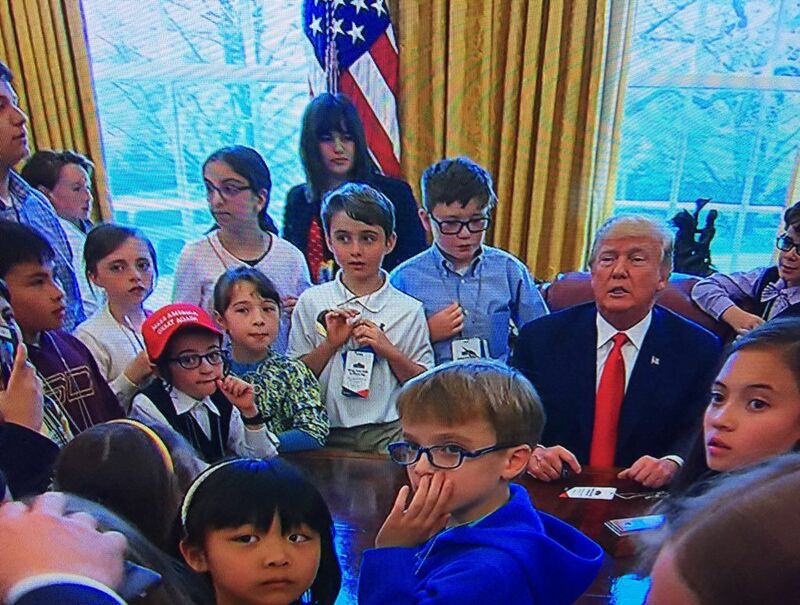 A chassidish child, decked out in traditional curly peyos and glasses, was easily spotted in Oval Office photos with President Trump from a Thursday visit. He is a son of Jake Turx – the Chassidish reporter that made international headlines after getting a Trump beatdown when asking a question during a press conference with Israel Prime Minister Netanyahu last year. 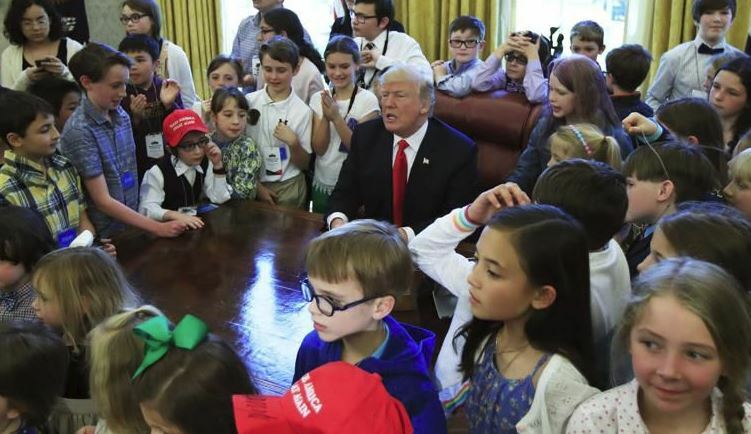 The boy was wearing a signed red “MAGA” cap, and was leaning on the Oval Office desk mere feet from the President of the United States, during a tour given to children of White House journalists on Thursday. 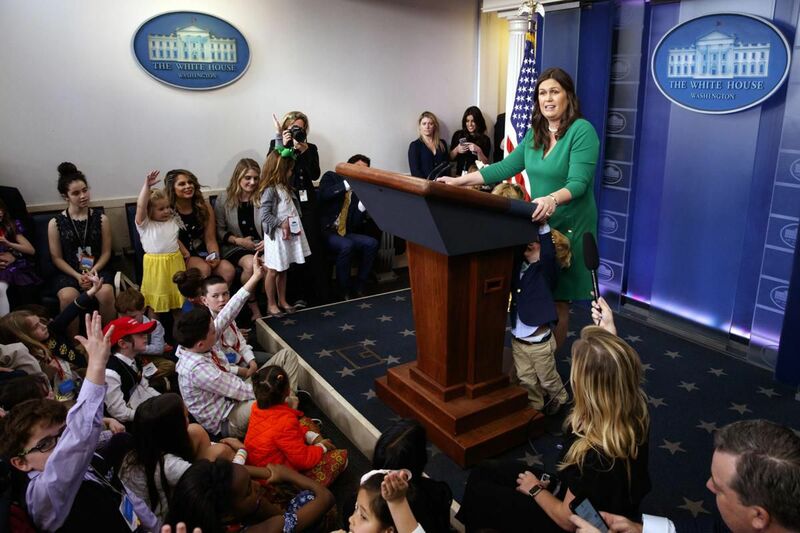 Earlier, press secretary Sarah Huckabee Sanders answered questions from the children during a mock press briefing, addressing Trump’s favorite animal and whether he likes candy. 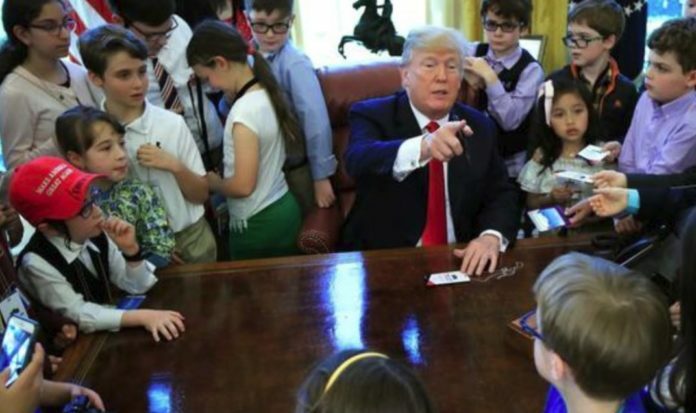 President Trump treated the children of White House journalists to an Oval Office visit Thursday but left their parents, many of whom he criticizes, outside looking in through the windows. 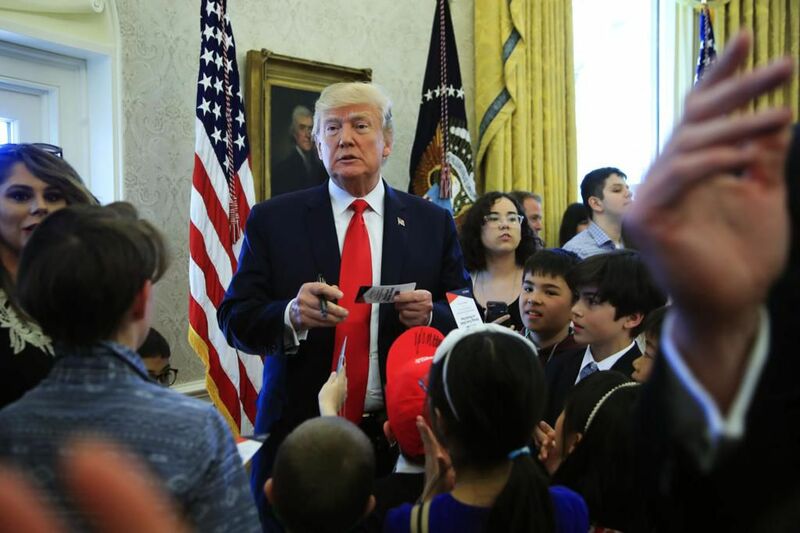 Trump autographed caps and commemorative passes worn by the children before taking them into the Oval Office. 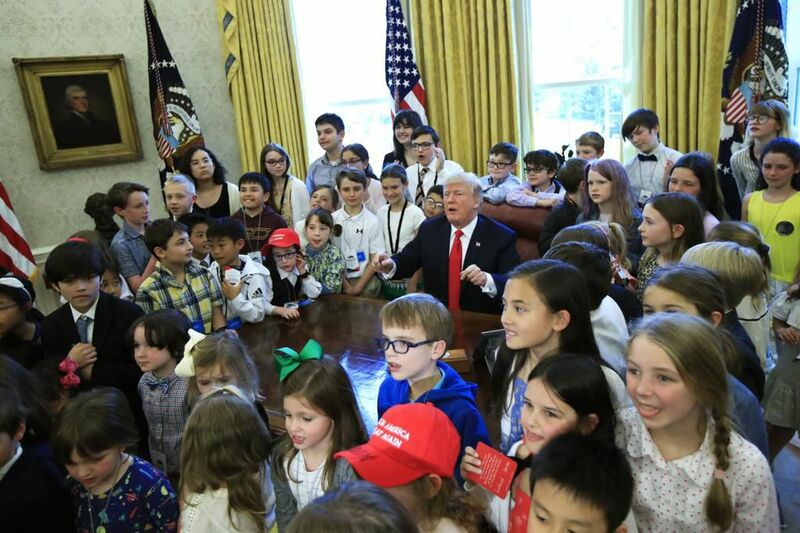 He had asked the kids whether they wanted their parents in or out of the Oval Office. “Out!” they exclaimed in unison, and so the grown-ups were left to huddle around and peep through the few available windows. Ha ha. Look at 1:43 of the video. You see a little cute kid pulling his (presumably) brothers nose. Nu, good question by Turx Jr. What was the answer given? Aw, how cute. How old is the little guy? The answer to Turx jr. Is easy, KAG, Keep America Great! 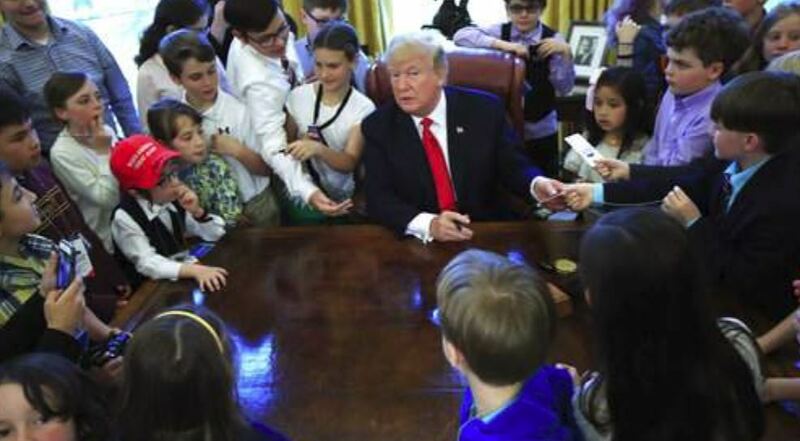 And that’s how Trump talks to kids about their parents. Is anyone surprised?! 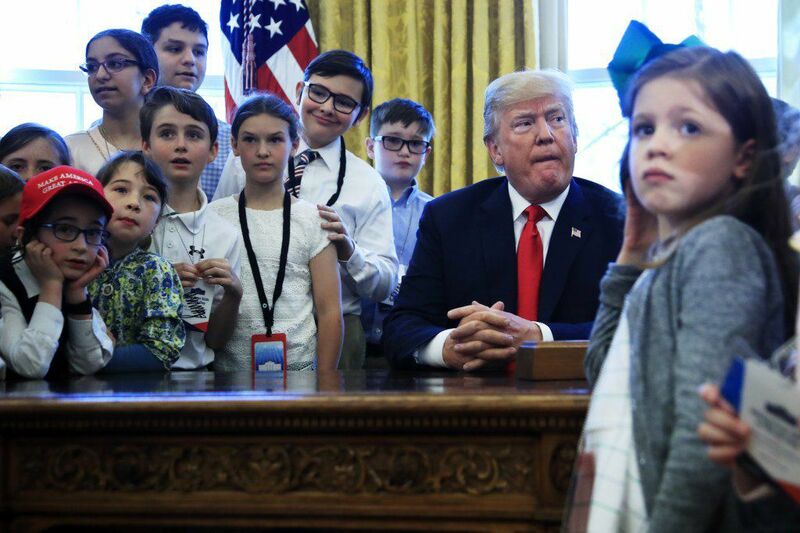 Is that his daughter next to his son? How exactly is this a Kiddush Hashem? Exactly why are you such a bitter person? And how do you talk about other kids’ parents? @nhorow: According to Joseph, as long as there is a chosid in the picture, its kiddush hashem. Which rav or halacha told u that it was a kiddish hashem? Im not saying it wasnt just curious what your basing your statement on? The non chareidi high school student from Parkland wore a yarmulkes, this kid wears a Trump hat. What a disgrace. What happened to geon yaakov? Why is he out of cheder today? There are non tznius people also in the picture, inappropriate for us to see.